This research guide identifies materials for basic and advanced research in philosophy. It lists a variety of sources, including databases, reference works, and Internet sites useful for the study of philosophy. Catalog of the books, media, journals, and other library materials owned by the UCF Libraries. Some listed content requires login with your NID. Search the Center for Research Libraries' vast collections of books, newspapers, microforms, journals, foreign dissertations, and other materials and request items via Interlibrary Loan (ILL). Enter what you're reading or your whole library—it's an easy, library-quality catalog. Library Thing also connects you with people who read the same things. Catalog of library collections from the U.S. and around the world. The world's most comprehensive bibliography, with millions of records for books, periodicals, and other materials in 370 languages and covering information from 4,000 years of knowledge. Includes RLIN catalogs and the Union List of Periodicals. "If the book is out of copyright, or the publisher has given us permission, you'll be able to see a preview of the book, and in some cases the entire text. If it's in the public domain, you're free to download a PDF copy." 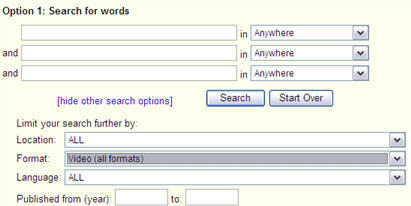 Use the advanced search screen so you can do more targeted searches. For example, do a subject search rather than a keyword search if you are looking for books on a particular topic or period. Use the "Find it in a library" link to see if the book you want is available in the UCF Libraries. Not everything is in Google Book Search, so use Google in addition to library catalogs and databases, not instead of them.